On October 1, the Globe and Mail will reveal a "dramatically redesigned" paper that's predicted to feature the most significant changes in the publication's history. The overhauled print edition will feature colour on every page, enhanced photo and graphic production, special stock paper and custom print options for advertisers. The October 1 unveiling will also kick off an eight-week, after school special-sounding series titled "Canada: Our Time to Lead." The weekend edition will be revamped to include an improved GlobeStyle and more in-depth editorial content and analysis. 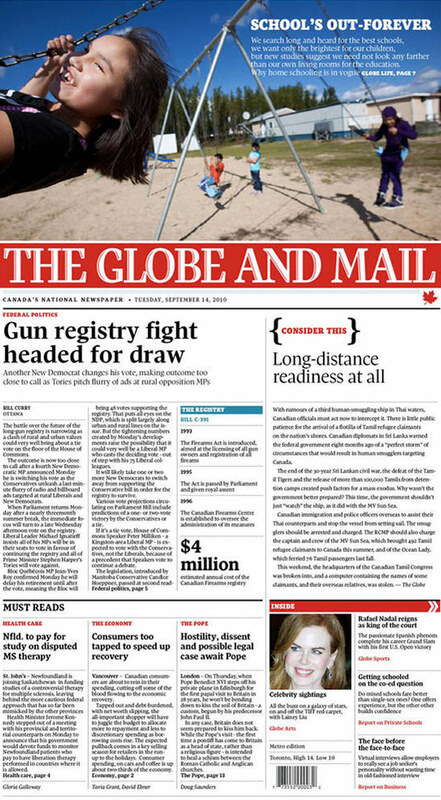 As well, the Globe and Mail's website, globeandmail.com, will introduce improved functionality and navigation and enhanced visual presentation. It all sounds great on, ahem, paper. But, the launch will likely be most exciting for those wondering whether or not it will reveal a print-model that ensures the Globe's long term prosperity -- or, as less optimistic critics of print might have it, itslong term survival. The paper's so-called "new era" is very much a product of the 18-year, $1.7 billion contract the publication signed with Transcontinental Inc. who has invested in cutting edge KBA Commander CT presses. But will it really matter how magical the ink-to-paper process ends up being? Will it the changes be primarily about style rather than substance? And perhaps most importantly, is the Globe simply betting on a dead horse? Globe Editor-in-chief, John Stackhouse caused a stir when he claimed that "we're trying not to be the paper of record, but the record of insight" at a journalism conference earlier this year. Although he later qualified that statement, he also noted at the time that the new paper will be "aimed at the digital reader." What exactly this means - in terms of editorial content - won't become clear until the October 1 launch, but it goes without saying that Globe is betting big on the future of print at a time when other publications are wary of making such a commitment. Reading the Friday paper should be interesting, if nothing else. There's a copy of the redesign floating around the net. Below is a copy. Lead photo by charmgirl13 on Flickr.